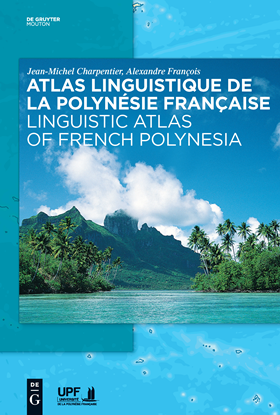 (with Jean-Michel Charpentier) Atlas Linguistique de la Polynésie Française – Linguistic Atlas of French Polynesia. Berlin & Papeete: Mouton de Gruyter & Université de la Polynésie Française. 2562 pp. (ISBN: 978-3-11-026035-9). The vast territory of French Polynesia is home to seven distinct languages – Tahitian, Austral, Ra’'ivavae, Rapa, Mangarevan, Pa'umotu and Marquesan – which in turn show internal variation. The fruit of ten years of joint work by two linguists of French CNRS, Jean-Michel Charpentier and Alexandre François, the Linguistic Atlas of French Polynesia pays tribute to the rich linguistic landscape of the country by documenting thoroughly twenty different communalects, in the form of 2250 maps. Organised by topics (body, life, individual and society, culture and technology, flora and fauna), these lexical maps are supplemented by explanatory notes and indexes in French, English, Tahitian. Text chapters in French and English present the social profile and the historical dynamics of the territory's languages, which are all endangered to various extents. 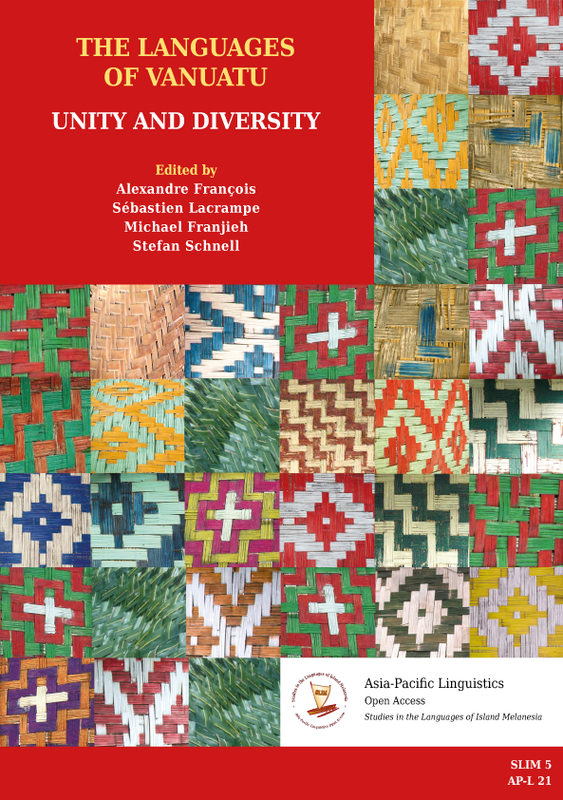 Published in open access, this multilingual and comparative atlas provides an essential reference to scholars and teachers alike, as well as to a broader audience keen to explore and preserve the linguistic heritage of the Pacific region. François, Alexandre. 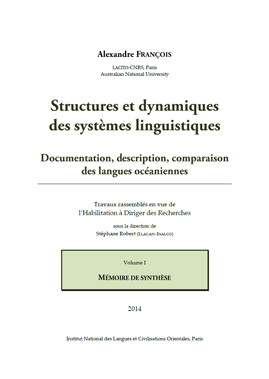 Structures et dynamiques des systèmes linguistiques: Documentation, description, comparaison des langues océaniennes. Dissertation for Habilitation à Diriger des recherches. Paris: Institut National des Langues et Civilisations Orientales. This dissertation forms part of the set of files I had to produce for my "Habilitation à Diriger des Recherches" degree in June 2014. Habilitation is required in French academia, for one to be entitled to supervise students. This 150-page document answers the requirement, within the Habilitation, to write (in French) a synthesis of my work and publications since I began my career as a linguist (1997-2014). François, Alexandre & Monika Stern. Music of Vanuatu: Celebrations and Mysteries. 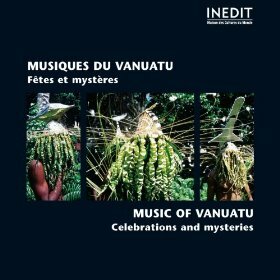 Ebook accompanying the CD album Musiques du Vanuatu: Fêtes et Mystères – Music of Vanuatu: Celebrations and Mysteries. Inédit, W 260147. Paris: Maison des Cultures du Monde. The musical arts of Vanuatu remain largely undocumented - whether in the detail of their instruments, melodies and rhythms, or the poetic forms and styles used in the songs themselves. And yet, these artistic practices include treasures worthy of being brought to light. This album aims to recreate the various musical atmospheres experienced by Vanuatu people in their lives. After listening to nature and the music it inspires, this musical journey meets daily life at the village with wedding and end-of-mourning ceremonies with dances, singing and drumming. The secular world of the village contrasts with the closed circles of important chiefs and Big Men, whose solemn grade-taking ceremonies are marked by the large slit gongs. Finally, comes the time of mystery. Initiates revive the dead and the ancestors with their song language and supernatural powers. Announced by the bullroarer, their steps dance to the sound of groaning voices and strange cries, punctuated by their drums and rattles. These field recordings were collected between 1997 and 2010 in Torres, Banks, Pentecost, Ambae and Maewo Islands. A Mwotlap - French - English cultural dictionary. This dictionary is a work in progress, and will remain so for some time. I have currently written about half of it. 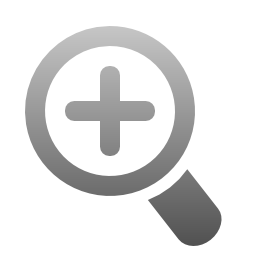 Check out the 2011 version of this dictionary here, or this online dictionary (interface in progress). Here is the 2011 version of my Mwotlap–French–English dictionary. Started in 1998, this work is still very much in progress, due to the various projects which I am committed to regarding the various languages of northern Vanuatu. With 1692 entries at this point, this dictionary only contains a portion – perhaps two thirds? – of the vocabulary I have collected in Mwotlap. Also, the published version of this dictionary will contain an introduction explaining typographical conventions and other elements useful to the reader. This whole endeavour belongs to my long-term projects. Mwotlap is an unwritten language spoken by about 1800 people in the Banks Is., Vanuatu; it belongs to the Oceanic branch of the Austronesian family. Besides presenting the first grammatical description of this endangered language, this book (in French) investigates more specifically the semantic mechanisms associated with predicates. Araki, an unwritten Austronesian language belonging to the Oceanic subgroup, is now spoken by less than a dozen people in a small islet of Vanuatu; it is likely to disappear very soon. As the first ever publication about this language, the present study covers all that it has been possible to gather from it. The core of this book is a grammatical description of Araki: attention has been paid to its phonology and morphology, the inventory of syntactic categories, the internal organisation of noun and verb phrases, the semantics of aspect and mood, complex sentence construction, and many other topics which illustrate the originality of this language. A bilingual lexicon is also provided, as well as a selection of texts. Contraintes de structures et liberté dans l'organisation du discours. Une description du mwotlap, langue océanienne du Vanuatu [Structural constraints and freedom in speech elaboration: A description of Mwotlap, an Oceanic language of Vanuatu]. Doctoral thesis in Linguistics, Université Paris-IV Sorbonne. 3 volumes (1078 pages, 472,000 words). Mwotlap (Motlav), an unwritten Austronesian language belonging to the Oceanic subgroup, is spoken by about 1800 people living in northern Vanuatu – Melanesia, South Pacific. Throughout this general description of its grammar, several issues are addressed, all of which are topics relevant to current functional and typological linguistics: phonology and morphology; syntactic categories; reference tracking, spatial deixis, possession and quantifiers; verb serialisation and valency; aspect and mood categories; discourse pragmatics and speech acts. Each grammatical structure is not only described synchronically, but also situated along diachronic paths of evolution. This is how multiple grammaticalisation patterns, as well as complex processes of syntactic and semantic change, gradually come to light. Due to the pressure of numerous cognitive and structural constraints acting on the speaker's mind, the power of linguistic innovation may even give rise to spectacular upheavals.